We specialize is offering unique products and services for the embedded electronics industry. We develop, design and manufacturer hardware solutions for a variety of applications, including Flash memory devices (NOR and NAND types), SPI programmable devices, JTAG applications, USB hardware development, wireless communication stacks, and end-user software. February 17, 2019: FlashcatUSB Mach¹ PCB 2.0 is now shipping. Performance is now more than 5MB/s (screenshot) for a typical X8 device. Software has been updated and FlashcatUSB Pro now supports JTAG boundary scan programming for directly connected parallel NOR Flash devices. January 20, 2019: FlashcatUSB Mach¹ PCB 2.0 is now in production and will be shipping soon in limited quantities. This new version has been redesigned to be even higher performance and now uses a FPGA design. If you have an older PCB 1.0, please contact us immediately to arrange an exchange. November 22, 2018: Cypress HyperFlash devices (S26KL/KS) are now officially supported by Mach¹. 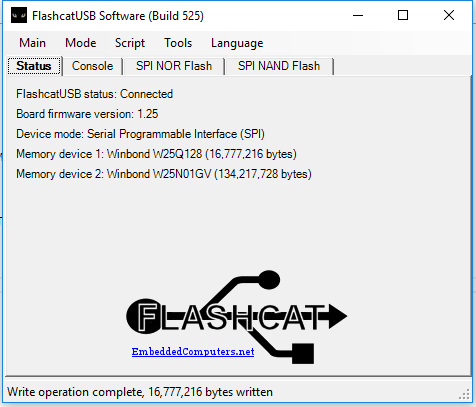 FlashcatUSB Software BETA is available for download. New features include Microchip one-wire devices and real-time buffer editing feature (Screenshot). See the documentation folder for more information. August 9, 2018: We now offer a wide range of BGA sockets. For SPI, we now have in stock BGA-24 devices. For parallel devices, we have BGA-64 (11x9mm, and 9x9mm), as well as BGA-63 for SLC NAND devices. Quantities are limited, contact us if you need a lead-time quote. Software has been improved and is now at Build 545. Mach¹ production and development is currently our highest priority and a new firmware update is coming soon. May 20, 2018: The software has been updated to build 538. Additional support and changes for PCB 4.0 have been added, including support for I2C devices (BETA). Also I am pleased to announce and the Mach¹ is now in the final production stages and we will be shipping first run boards to early backers of the project this week! May 8, 2018: FlashcatUSB Professional has been upgraded to PCB 4.0. We redesigned the hardware to use a high-speed (480Mbps) USB interface in combination with an in-circuit programmable CPLD for maximum speed and utility. If you have an older 3.x board, please contact us to take advantage of our trade in program. The software has also been updated to build 533 and includes many new updates to our NAND engine. March 8, 2018: A FlashcatUSB software has been upgraded to include a ton of new features. OTP EPROM devices has been added to support various PLCC-32 and DIP-32 devices. The language file has been updated to include Italian and Chinese. JTAG support has been added to Professional. The Flash library has been updated. And Winbond W25M121AV (NOR and NAND) has been added (see image). January 19, 2018: A new major software update has been posted. This version (Build 514) adds many new features, including updated multi-language support, and support for ECC for SLC NAND devices. The software can now be configured to automatically load ECC data and auto-correct data on the read operation, as well as generate ECC data and write it during a program operation. 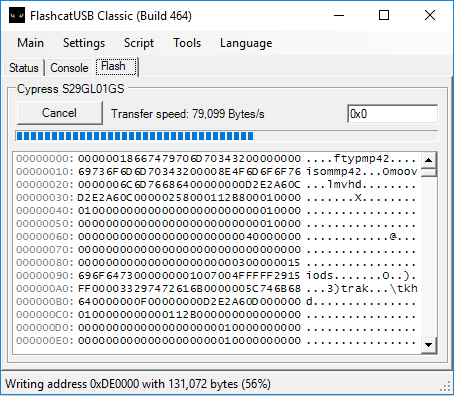 December 5, 2017: FlashcatUSB Software (Build 501) is now available for download. This version adds updated SPI-NAND support, additional SLC NAND options, and better read/write support. New firmware is also included and must be installed prior. This release supports Classic, Professional and xPORT hardware platforms. November 19, 2017: FlashcatUSB PCB 2.2 giveaway! We are currently re-updating the language files of the FlashcatUSB software and are asking for translations. As a special reward, we are sending new FlashcatUSB Classic (PCB 2.2), including shipping, to each contributor. 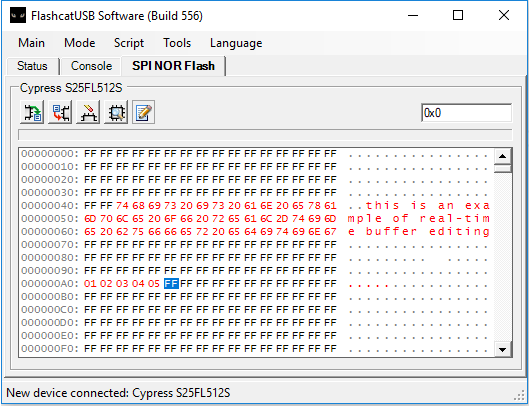 November 8, 2017: The software has been updated to support SPI NAND devices for both FlashcatUSB Classic and Professional. Serial NAND devices from Micron and GigaDevice are supported up to 4Gbit, which includes the MT29FxG01A and GD5F product lines. In addition, lots of other SPI devices have been added, as well as many software fixes. October 13, 2017: The FlashcatUSB software, script engine, and other modules have finally been merged into a single code tree for both Classic and Professional applications. This means the software for both hardware will be distributed together from now on and a update in one will also update the other. The newest software release is now available for download and includes new AVR firmware for Classic, new USB drivers, updated SPI database, and the JTAG engine (including TAP state-machine) is now accessible via the script engine (see included documenation). Head over to the Software page to download the newest version! September 24, 2017: Major BETA updates are now available. This includes major changes/update to both the Classic and Professional software. Updates include the Flash database, the Extension Port engine, and a new Multi-device mode has been added (see screenshot), which will allow high-volume/production use of the hardware. And finally enclosures/cases for FlashcatUSB Professional are now in stock and will be included with every order. August 21, 2017: FlashcatUSB xPort is now available. This FlashcatUSB product is based on the Classic design which incorporates the extension port into a single chip solution that is low-cost and twice the performance. In addition, the Classic (Build 462) and Professional (Build 145) software has been updated. Support for Spansion's Write-to-Buffer (screenshot) has been added and A24(Extension Port)/A26(xPort) address support has been added to the EXT IO mode. June 18, 2017: New software updates for FlashcatUSB Classic (build 446) and Professional (build 130) have been posted. June 4, 2017: New BETA software updates for FlashcatUSB Classic and Professional are ready. Extension port transfer speed has been increased by more than 25%. 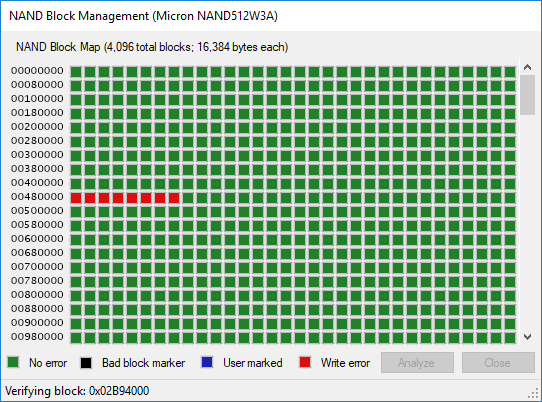 The NAND engine has been updated, and a new tool (Block Manager) has been added to allow real-time interactation with the block map feature. Download Build 445 (FCUSB Classic). Download Build 125 (Professional). May 11, 2017: FlashcatUSB build 434 has been posted. Download here. Changes include all of the updates from the BETA and 25% increase in NAND read/write performance. In addition, FlashcatUSB Professional Build 120 BETA has been posted as well. Download here. Support for the Extension Port (NOR X8, X16 and NAND) has been added. April 20, 2017: FlashcatUSB BETA software build 430 is now available. This version includes a new updated firmware (4.18). And includes over a dozen new changes, updated Flash SPI database (over 20 new ISSI devices added), and the software has better quad I/O support. With this version, you can now connect to a SPI flash in quad mode and be able to perform read/write operations. In addition, the interface has been upgraded to now support device-specific configurations (if available) for select SPI devices (see screenshot). If you have a SPI with non-vol settings that you need to use, contact us to add support. And finally, a major FlashcatUSB Professional software update is going to be posted within a few days. We are currently busy testing the new library and functions with the thousands of Flash devices we currently support. March 19, 2017: FlashcatUSB Professional (PCB 3.0) is now available. Quantities are limited. SO-44 Adapters for the Extension port have been revised and now include an on board charge pump to supply VPP with up to 12v (required for some Flashes). The DIP32 adapters is now available as well. 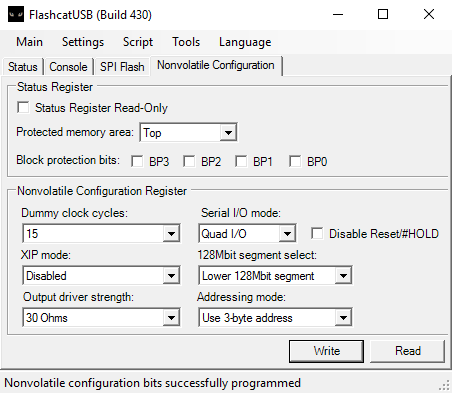 January 16, 2017: FlashcatUSB build 406 BETA is now available for download. A new firmware version (4.13) is included. The Flash database has been updated, new flash writing timing feature has been added, and the Flash writing tab has been updated. December 20, 2016: FlashcatUSB build 404 and firmware version 4.12 BETA is now available for download. Includes updated NAND engine, and SPI flash database. FlashcatUSB Professional is now available for pre-order, this new PCB 3.x version includes over 10 times the performance of the previous generation. November 20, 2016: FlashcatUSB build 400 and firmware version 4.12 BETA is now available. This version includes the new upgraded NAND engine that supports all of the newly added NAND flash devices. In addition, the software buffer has been changed to allow files to be read and written to via a stream, instead of coping the entire file to memory prior to performing a read or write operation. November 11, 2016: WSON-8 SPI sockets are now available as well as TSOP-48 adapters for NAND type memory devices. November 6, 2016: FlashcatUSB Software version 392 is available for download. Updated several bugs that have been reported. Also added Nordic nRF24LU1+ device support. AVR firmware has been updated to 4.10. October 16, 2016: FlashcatUSB Software version 390 is available for download This version features a new upgraded AVR firmware (4.09) that adds full support for the Extension Port and adapters. 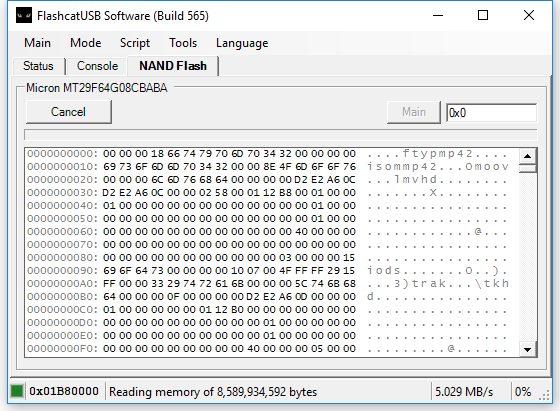 The new NAND Flash feature (screenshot) allows full programming of NAND Flash memory via the TSOP-48 Type-B socket. SPI database has been upgraded, and the Micron N25Q512 device support has been fixed. September 10, 2016: FlashcatUSB build 380 BETA with new AVR firmware (4.07) is ready for download. This version (which is mostly for BETA users) adds support for the PLCC-32 and TSOP-48 socket adapters, and also adds over a dozen new SPI Flash memory devices. July 20, 2016: A new update is ready for download. Software build 371 includes many updates for the SPI engine, including adding the ability to switch between page and extended page options for Atmel / Adesto series 45 devices. See screenshot. July 18, 2016: The FlashcatUSB Extension Port is now in production. This new add-on device adds support for CFI / parallel memory devices (PLCC-32, TSOP-48, TSOP-56, etc.) directly without using JTAG. May 22, 2016: Software has been updated to build 370. Changes include support for I2C devices with 8bit addressing, additional SPI EEPROMS added, script engine updated, better device compatibility, and more. Download Now. New arrival: DIP8 socket (version 2) now in stock, this version includes support for both SPI and I2C devices! March 22, 2016: A new software update is available for download. Build 368 includes updated Flash database, JTAG support for Lattice CPLD, updated SVF Player, script engine fixes, and more. February 2, 2016: Software version 365 and source code are now available for download. Software now includes support for SQI devices. New arrival: 1.8v SPI adapters are now in stock (purchase here). January 16, 2016: Software version 365 is being finished at the moment, it will be available in about 1 week. In addition, the CMOS memory adapter is now available. November 30, 2015: Software update (build 362) - includes updated SPI database and now supports CMOS memory (i.e. W49F002U) via a low-cost PLCC32 adapter that we are now producing. If you need this adapter, send us a email so we can get you on the wait-list. November 1, 2015: Software update (build 355) - includes Repeat Write Operation feature, as well as adds predefined settings for ST M95xxx series. October 20, 2015: Software has been upgraded to RC18 Build 352! August 25, 2015: Device has been upgraded to now support I2C EEPROM (see screenshot)! July 31, 2015: Software has been updated to RC17, build 350! Lots of new features. Also includes new firmware for PCB 2.x boards. May 14, 2015: SPI test clips are now available for sale. These are wired specifically to work with FCUSB. April 5, 2015: Software has been updated to build 345. 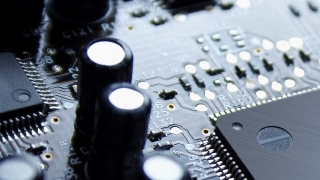 Our embedded solutions include circuit board design, manufacture, component assembly and PCB rework. We offer a wide range of industry standard technologies including high-pitch surface mount technologies, including QFN and BGA packages. We also offer embedded technology consulting for companies that may want to explore different options available. 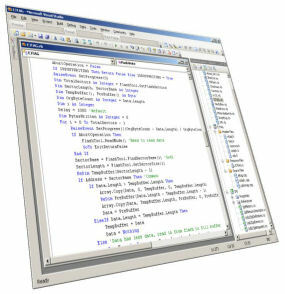 Our software development services are very efficient, low-cost, and fast. Our experienced team of programmers can complete your project on time. If you need a quote for a new project, just use the contact us page.